Visitors to the city of Stockholm who find themselves with an hour or two to spare can enjoy a walk in Swedenborg’s old neighborhood, in the city’s Södermalm district. 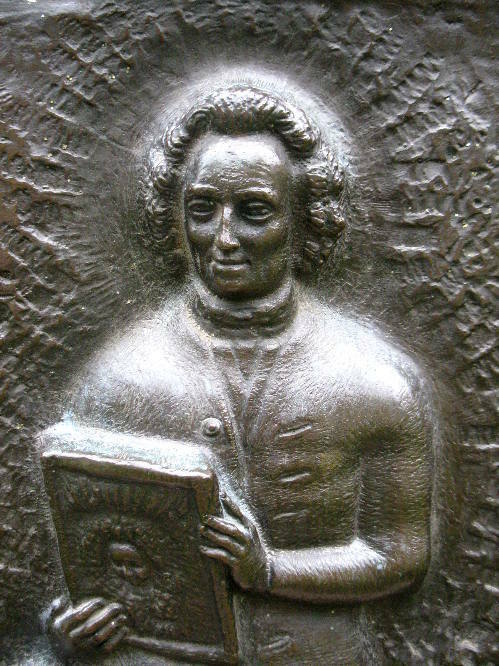 The memory of the Swedish scientist, philosopher and theologian is kept alive in the area thanks to several public monuments in his honor and a street bearing his name. The Stockholm Metro (Stockholms tunnelbana) includes a stop named Maria Square (Mariatorget), located just one block from the square and city park. 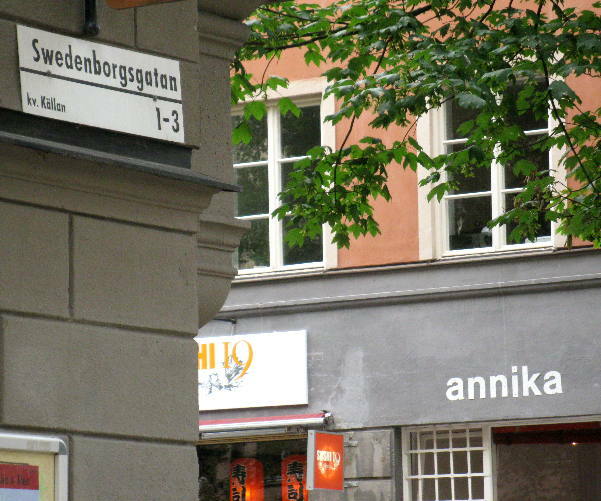 The stop exits onto Swedenborg’s Street (Swedenborgsgatan), which terminates at the square. For Google Maps coordinates go here. 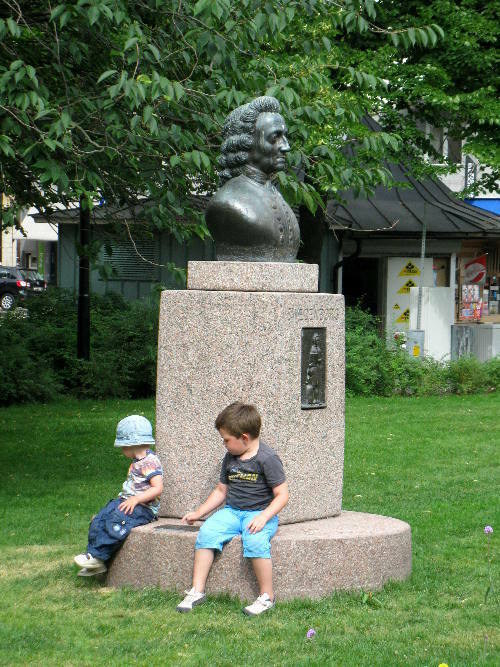 Maria Square, called Adolf Fredrik’s Square in Swedenborg’s time, features a large fountain and a number of bronze sculptures, including a bust of Swedenborg made in 1973 by the Stockholm artist Gustav Nordahl. (See photos, left.) On the pedestal just below the bust is a bronze relief depicting the famous story about Swedenborg and the “angel” in the mirror. As the story goes, a girl from the neighborhood repeatedly asked Swedenborg to show her an angel. 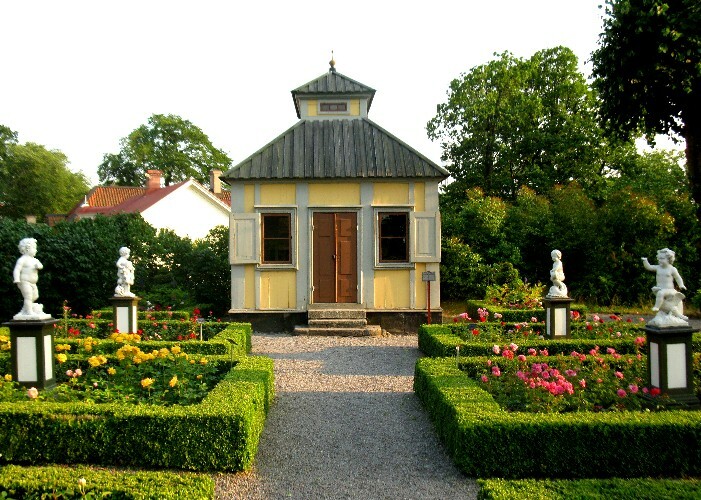 It’s July, and the roses are blooming in Swedenborg’s summerhouse garden at Skansen, an open-air museum in Stockholm, Sweden. 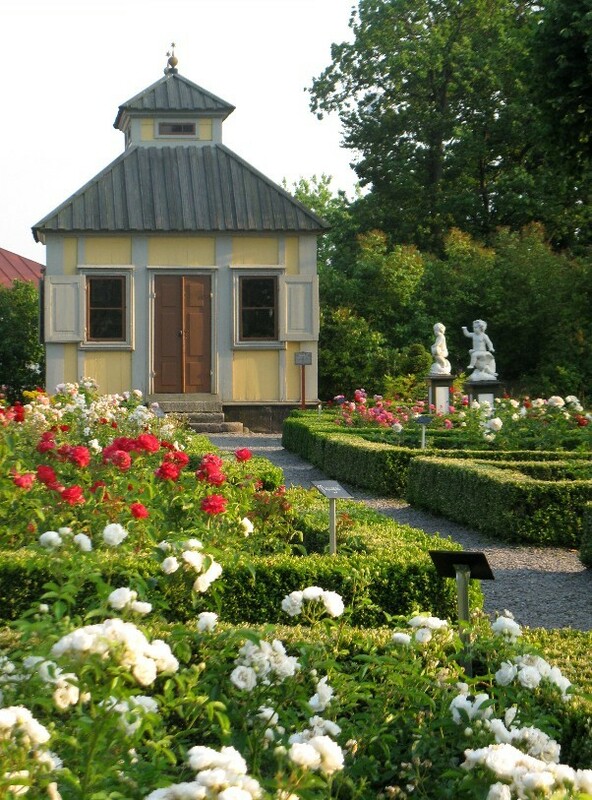 The rose garden at Skansen, designed in 1964 by the landscape architect Walter Bauer, was not intended to replicate Swedenborg’s original garden. 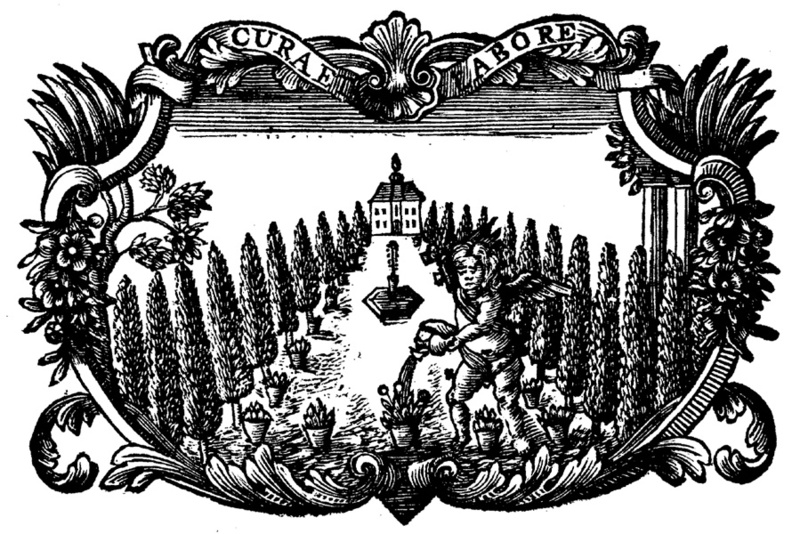 Nevertheless, with a little imagination Bauer’s formal garden may serve to evoke some sense of the flowery vista that originally led the way to Swedenborg’s summerhouse. Skansen, the world’s first open-air museum, was founded in 1891, gathering together historic buildings typical of various regions in Sweden. Today it remains one of Stockholm’s most popular tourist destinations. 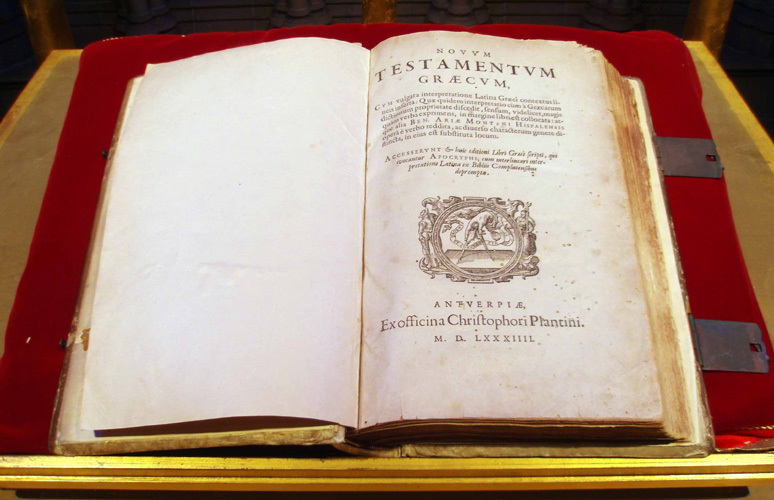 “Emanuel Swedenborg’s theological first editions are rich with ornaments. Swedenborg sent his theological contribution into the world heavily and consistently adorned with graphic decorative touches. Yet few know of their existence. 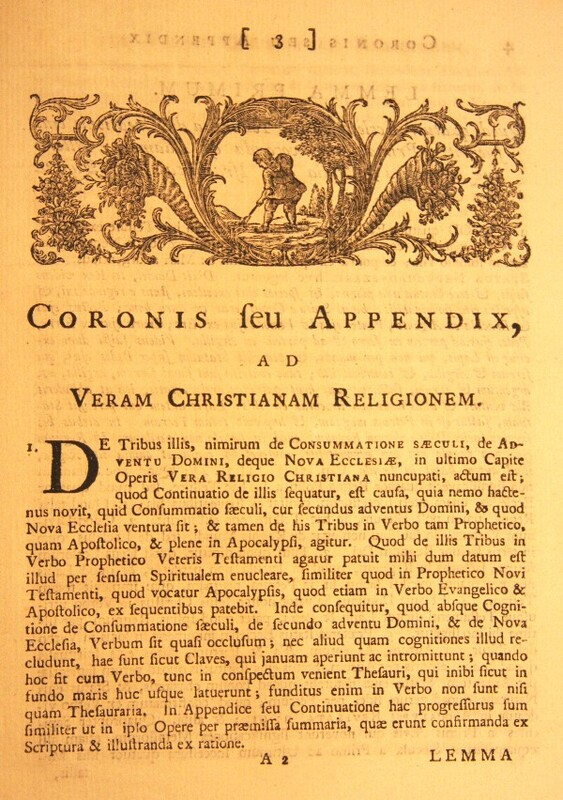 Although every theological word penned by Swedenborg has long ago been translated into English, although subsequent Latin editions, and translations into thirty-four languages, have brought his unique thoughts and experiences before the world, the ornaments that formed an integral part of his original publications have been all but lost” (Jonathan Rose, “The Ornaments in Swedenborg’s Theological First Editions,” Covenant, vol. 1, no. 4, Spring 1998). In 1910 the International Swedenborg Congress was held in London, England, to celebrate the one hundredth anniversary of the foundation of the Swedenborg Society. 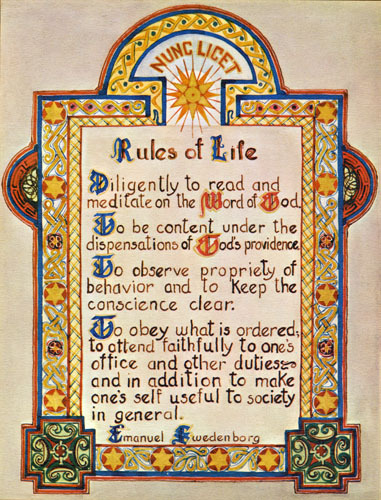 The Society had officially been instituted on February 26 in 1810 for the purpose of translating and publishing the works of Emanuel Swedenborg. 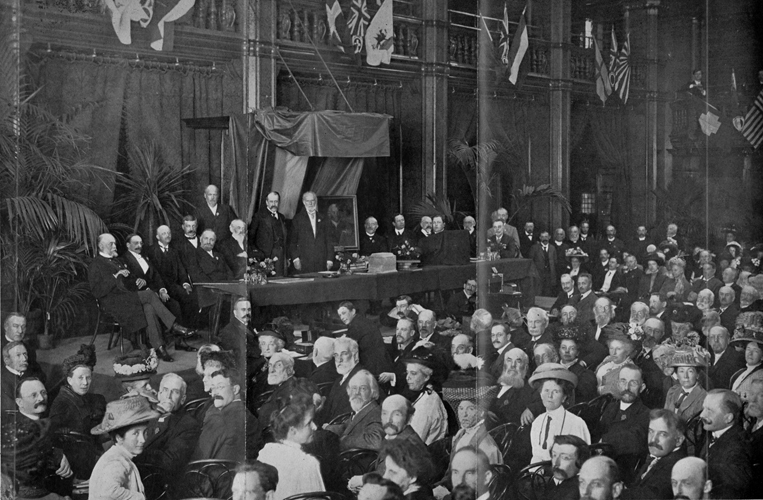 About four hundred representatives came to the Congress from countries around the world, including England, the United States, Canada, Australia, India, France, Germany, Austria, Switzerland, Spain, Sweden, Norway, Belgium, and Holland (see Swedenborg Society, Preface, Transactions of the International Swedenborg Congress, 1910). 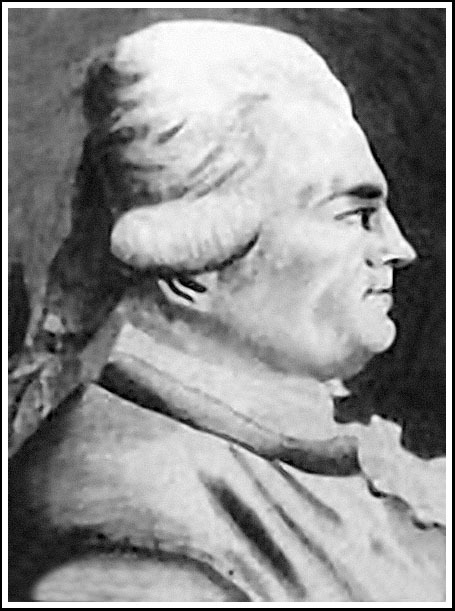 August Nordenskjold, born in Finland in 1754, was one of the earliest promoters of the works of Emanuel Swedenborg in Sweden. At some point approximately twenty-six first edition volumes of Swedenborg’s writings, containing Nordenskjold’s signature, were acquired by John Pitcairn (1841-1916). 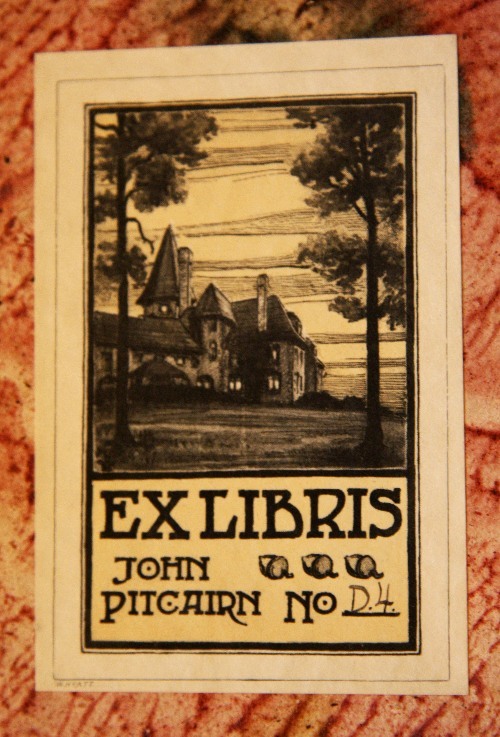 The books were on exhibit in the John Pitcairn Archives for many years, located in the former garden house at Cairnwood, Pitcairn’s estate in Bryn Athyn, Pennsylvania. They are now being relocated to the Swedenborgiana collection at the Swedenborg Library in Bryn Athyn (email communication. Lisa Parker Adams, 3/31/10). These books are all similarly bound, but the date of the binding is unknown. About half of the signatures are curiously rubbed out. Place names (Stockholm, Gothenburg) and dates accompany the signatures (see photos below). 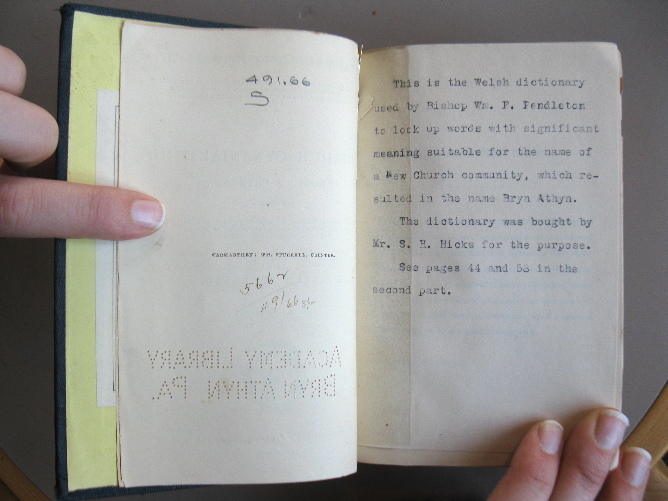 No definitive record has been found to indicate when Pitcairn purchased the books, but he may have bought them in England in 1877. His diary entry for August 4, 1877 mentions a visit to Henry Wrightson, “an old bachelor born 1803. 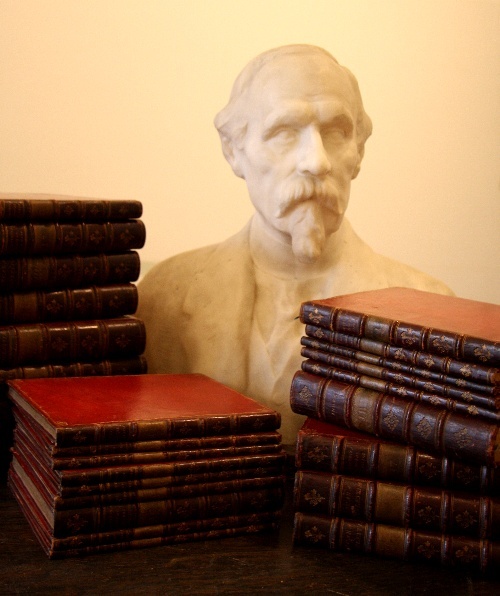 He has a passion for collecting the original Ed’s of Swedenborg. . . . He has a complete set & many volumes of the original Editions of Swedenborg” (John Pitcairn. Transcript of Diary entry. 4 August 1877). C. T. Odhner, in his biography of John Pitcairn printed in New Church Life, describes this same visit, and adds that “Mr. Pitcairn purchased from Mr. Wrightson a great number of original editions for the Academy’s library, many of them sumptuously bound” (C.T. Odhner, “John Pitcairn: A Biography,” New Church Life 1917, 518). “Of one thing I am sure; any effort is worth while that brings comfort to limited, struggling human beings in a dark, self-centered age; and Swedenborg’s message has meant so much to me! It has given color and reality and unity to my thought of the life to come; it has exalted my ideas of love, truth and usefulness; it has been my strongest incitement to overcome limitations. The atmosphere Swedenborg creates absorbs me completely. His slightest phrase is significant for me. His Divine Love and Wisdom is a fountain of life I am always happy to be near. I find in it a happy rest from the noisy insanity of the outer world with its many words of little meaning and actions of little worth. I bury my fingers in this great river of light that is higher than all stars, deeper than the silence which enfolds me. It alone is great, while all else is small, fragmentary. Were I but capable of interpreting to others one-half of the stimulating thoughts and noble sentiments that are buried in Swedenborg’s writings, I should help them more than I am ever likely to in any other way. 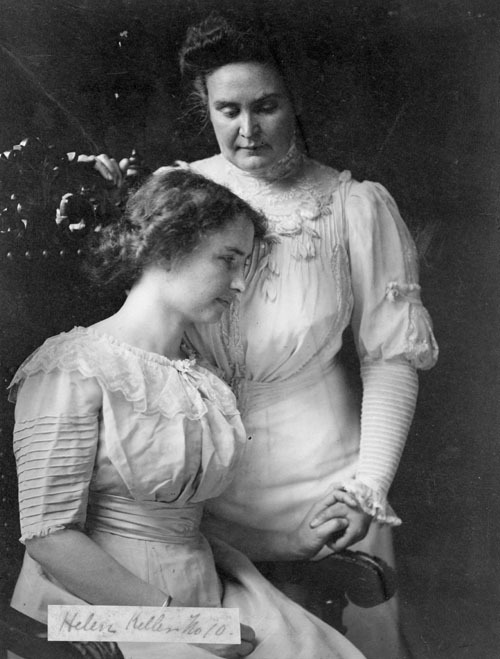 There is a year of hard work before me; but I should like to begin it with the feeling that I had rendered my fellowmen such a spiritual service” (Helen Keller. Letter to Rev. Paul Sperry. 10 October 1926). 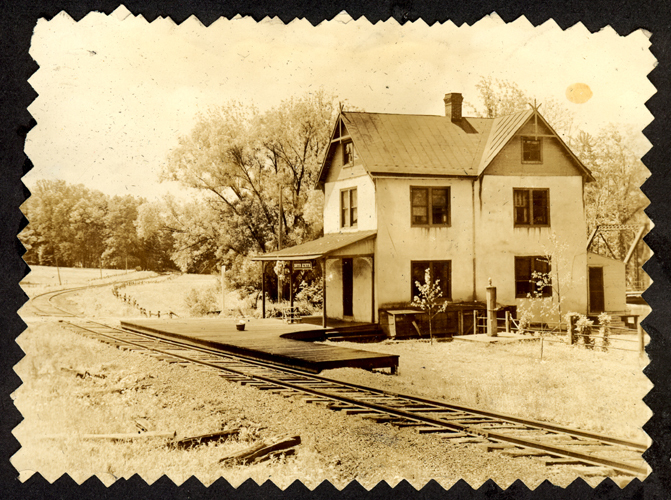 “Huntingdon Valley, Pa.-Correspondents will please note: There is no such post office as Bryn Athyn. Letters so addressed will be apt to go to the Dead Letter Office at Washington. It is now the name of the nearest railroad station, however (formerly ‘Alnwick Grove’), and when the community has largely increased we may hope for greater postal and other conveniences. But of the future no man knoweth” (“Church News: Reports and Letters,” New Church Life 1899, 159). 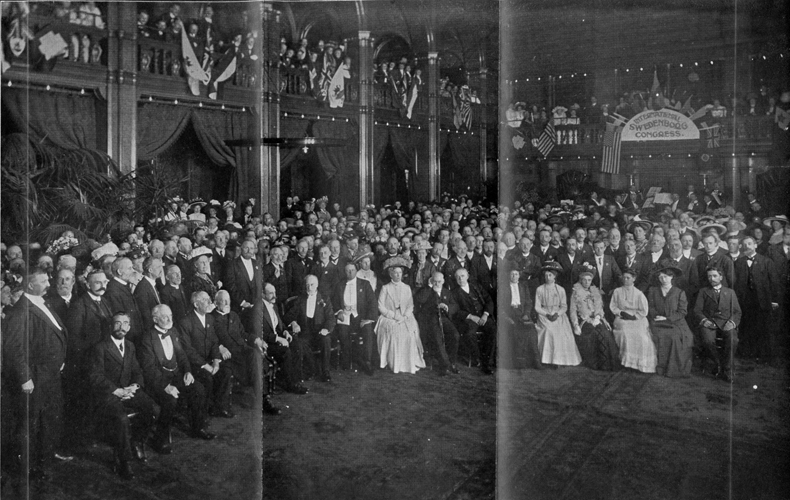 “More than two hundred persons, among whom were a great number of ladies, assembled yesterday in the Gala-rooms of the Grand Hotel [Stockholm] in order to celebrate the bi-centennial of the birth of Emanuel Swedenborg. . . . Noteworthy among the participants were the former Minister of Foreign Affairs, Baron Hochschield [sic], the Lord Chamberlain Baron Carl Jevard Bonde, the President Woern, the Professors Baron Nordenskjold, Victor Rydberg, [Hugo] Gylden, Members of the Academy of Science, higher officials, prominent physicians, members of the Diet, manufacturers, merchants, members of the New Church in this place, and others” (January 30, 1888 entry from Stockholm’s Dagblad (Newspaper) in New Church Life 1888, 41). 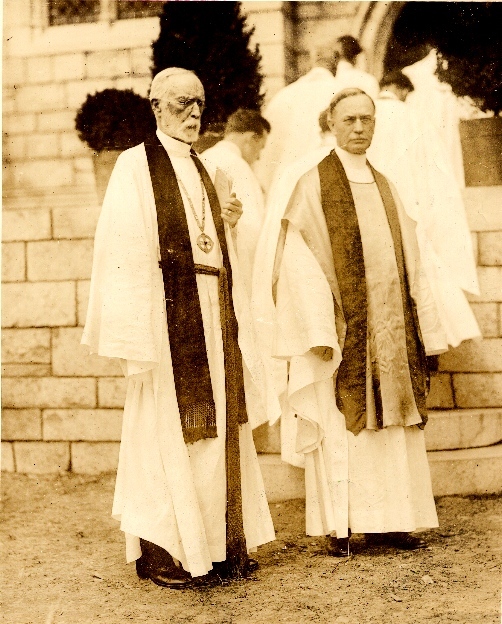 The Academy of the New Church began its formal existence on the 19th of June, 1876, but January 14th, 1874, was regarded as the unofficial beginning of the organization and celebrated as Founders Day for many years. On January 14th, 1874, John Pitcairn wrote a check for five hundred dollars in order to defray the costs of a proposed publication to begin “a reformatory movement in the New Church” (New Church Life 1911, 189). 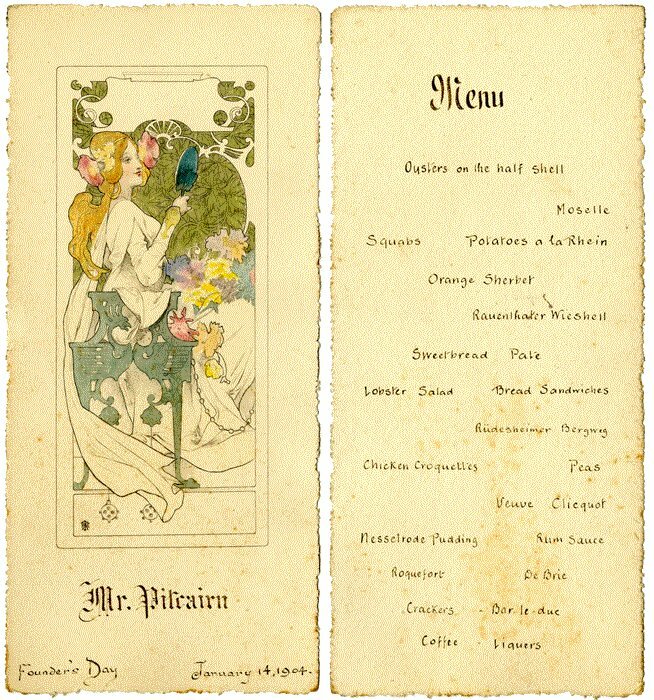 Two days earlier, a group of men had met at the Atlantic Garden restaurant on Diamond Street in Pittsburgh, Pennsylvania, and formulated the idea for this movement. 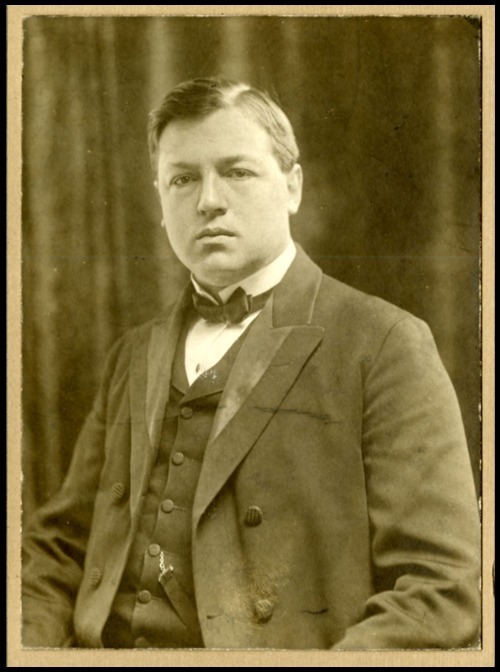 Those present were Frank Ballou, Walter C. Childs, William Henry Benade, and John Pitcairn (see photo, below). 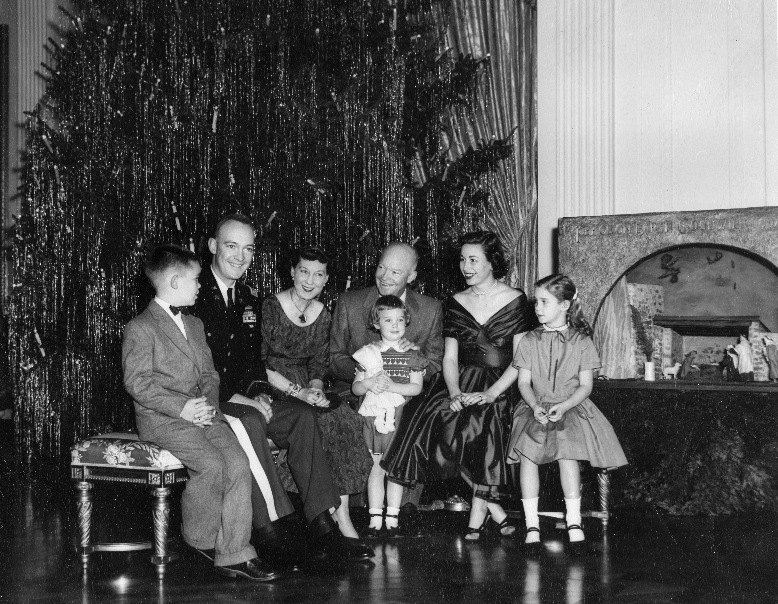 The staff of NewChurchHistory.org would like to wish all of our readers a Merry Christmas and Happy New Year! 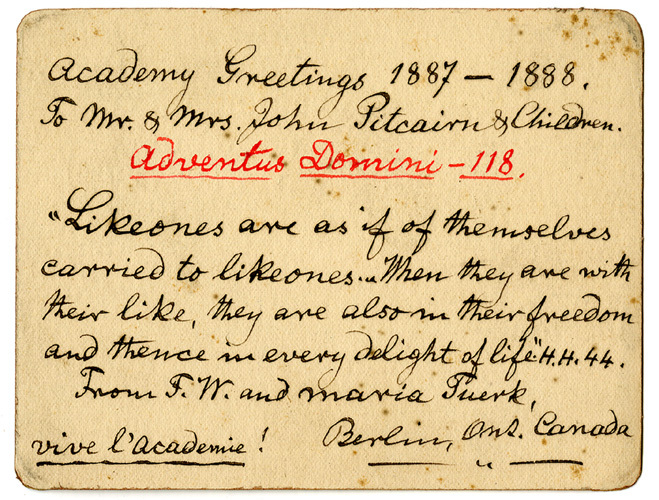 The three holiday cards included here are from the Glencairn Museum Archives in Bryn Athyn, Pennsylvania. 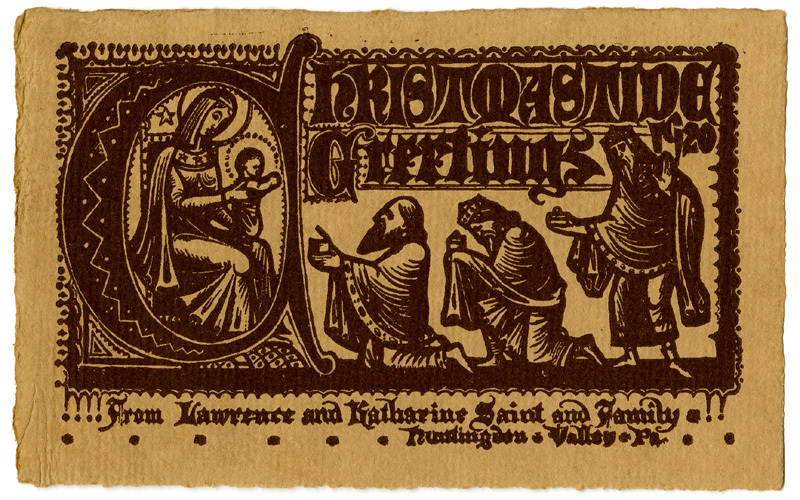 The first card was created by Lawrence Bradford Saint (1885-1961) and sent out by his family in 1920. Saint was a stained glass artist who worked on the Bryn Athyn Cathedral project from 1917 until 1928, when he left to work on the Washington National Cathedral. The figures on this card bear some resemblance to a stained glass Christmas window he made for Bryn Athyn Cathedral in 1919. 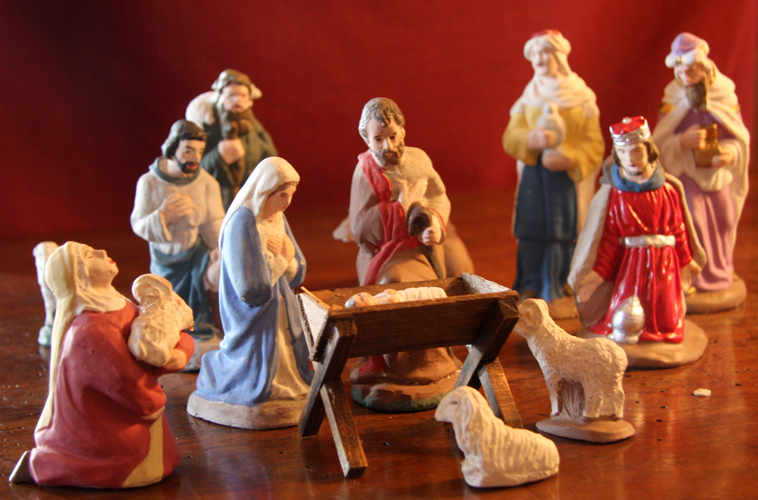 Theta Alpha, an organization for New Church women, began making Nativities in 1941, and continued the tradition until the early 1990s. 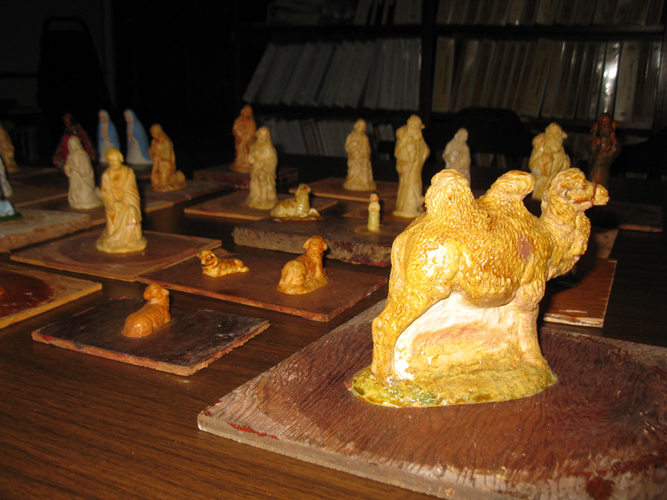 The Nativities were sent to families who did not live near a New Church congregation. This was part of a larger initiative by Theta Alpha to send religious materials throughout the year to children who could not attend New Church schools. 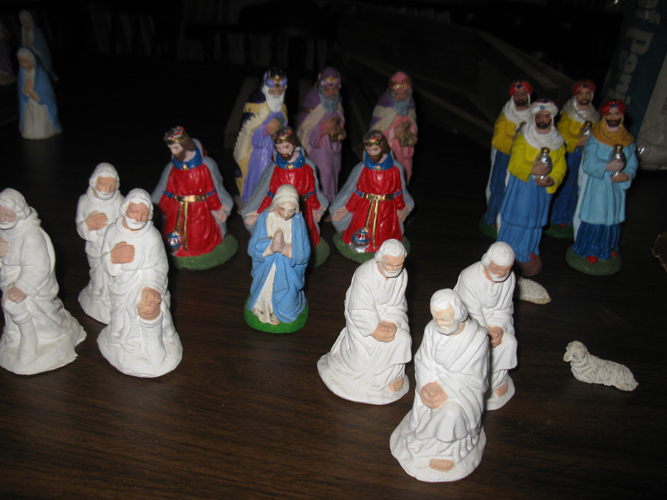 The women of Theta Alpha were inspired in their production of Nativity sets by Emanuel Swedenborg’s concept that children are especially receptive to visual images, and can be introduced into deeper concepts by means of them. “Children [in heaven] are taught especially by images suited to their natures, images that are unbelievably lovely and full of wisdom from within. In this way, there is gradually instilled into them an intelligence that derives its essence from goodness” (Emanuel Swedenborg, Heaven and Hell ¶335). 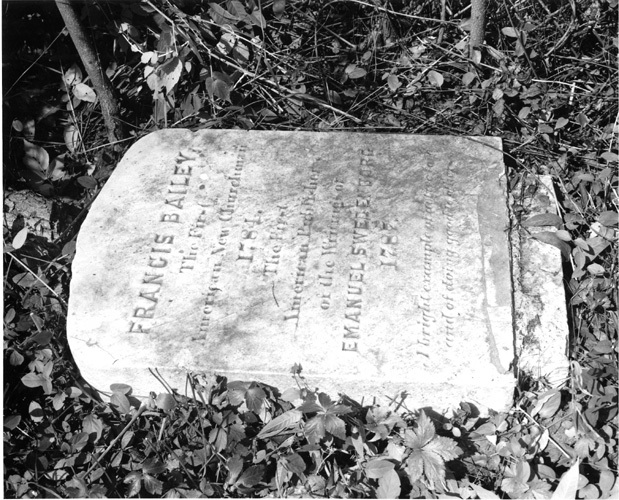 “FRANCIS BAILEY/The First/American New Churchman/1784/The First/American Publisher/of the Writings of/EMANUEL SWEDENBORG/1787/A bright example of active love/and of doing good to others” (Francis Bailey tombstone). These words were written on a stone monument erected in 1915, in memory of the Upper Darby church building that had been demolished a few years previously. 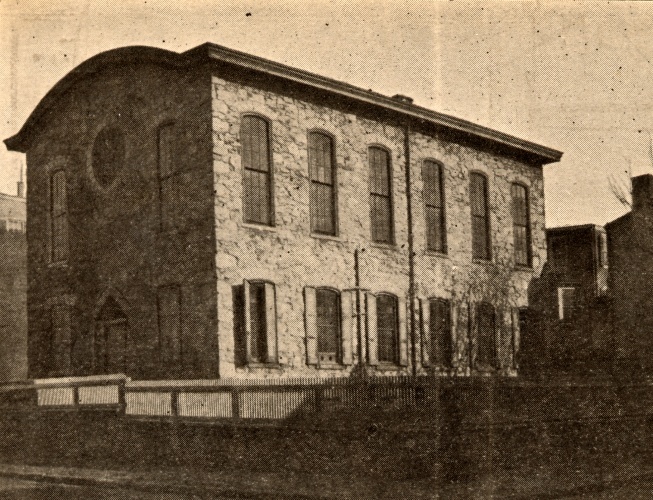 The church (see photo, top) had been vacant since the late 1800s when the congregation worshipping there became inactive. The historic cemetery surrounding the church remained intact until the late 1960s and 70s, at which time the effects of years of vandalism could no longer be ignored, and it was decided to remove the bodily remains and try to resolve the issue of headstones. Many of the headstones had been irreparably damaged, so a decision was made to bury the ones that could not be saved, and offer the undamaged ones to their descendants (Communication from Philip Alden to David B. Glenn, 8/31/1978). The bodily remains were transferred to an unmarked grave in Mt. 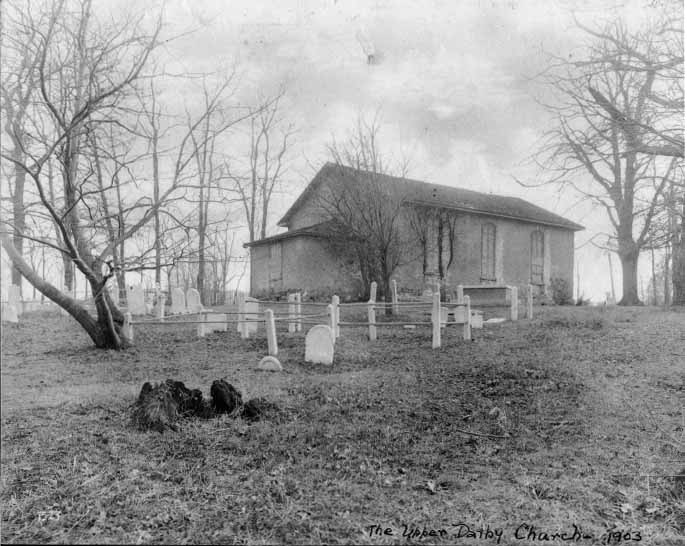 Zion Cemetery in Delaware County (http://files.usgwarchives.net/pa/delaware/cemeteries/newjerus.txt). 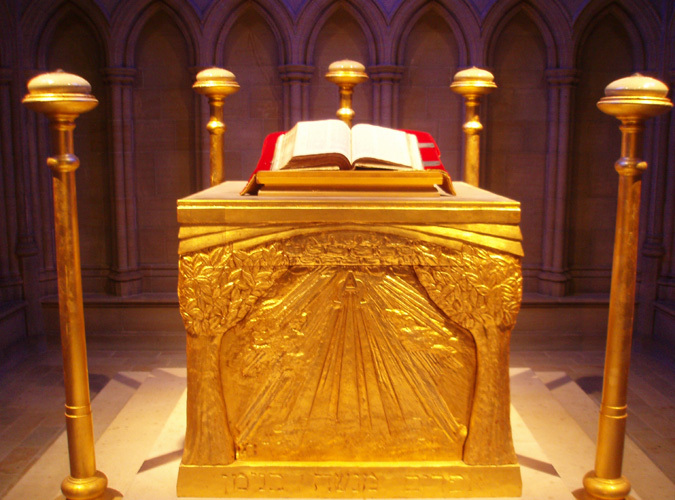 At worship services in Bryn Athyn Cathedral in Bryn Athyn, Pennsylvania, the visual focus of the congregation is a large copy of the Word on the altar in the sanctuary. On sunny mornings the Word is bathed in a soft violet light created by stained glass windows on either side of the altar. Additional light is provided by seven golden lampstands. 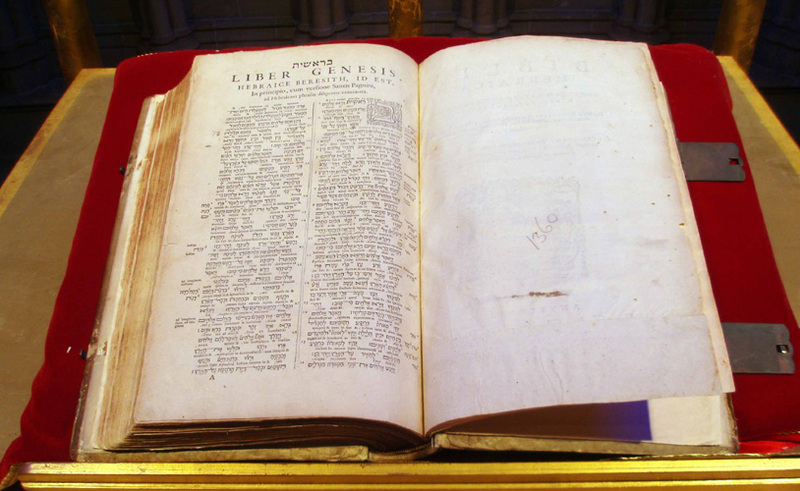 Although Bryn Athyn Cathedral’s copy of the Word has been the focus of services since the building’s dedication in 1919, many are not familiar with its interesting history, which dates back to the sixteenth century. 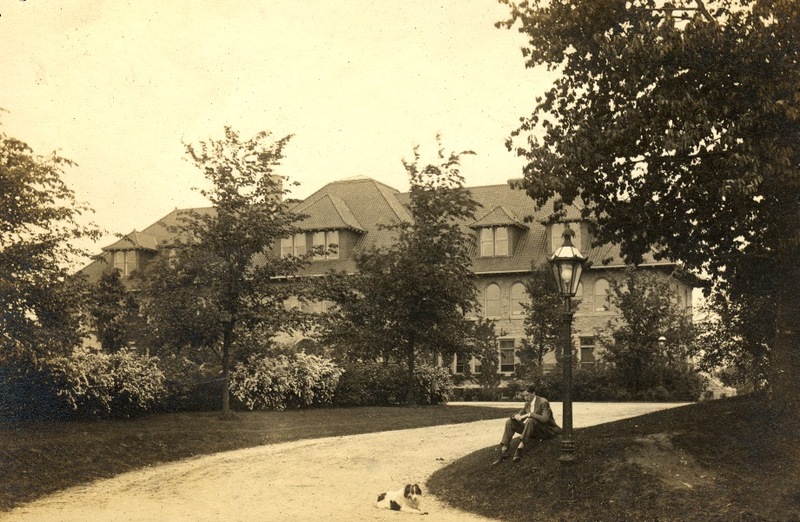 “Visitors to the Bryn Athyn of four months ago would hardly recognize the present perspective and those who knew our institution in Friedlander street, Philadelphia, will rub their eyes and wonder if this is, indeed, the same old ‘Academy’” (Editor, New Church Life 1904, 569). Those individuals who have recently visited the new buildings on the campus of Bryn Athyn College, in Bryn Athyn, Pennsylvania, may find that the above sentiment, expressed over a hundred years ago, speaks equally well to the present day. From time to time new photographs surface following the publication of a New Church History Fun Fact. Each Fun Fact is researched and written within a very limited time frame, making it likely that new materials will come to light at a later date. In fact, one of the most exciting aspects of this project is the additional information we periodically receive from our readers. Every Fun Fact sent to our subscribers via email also exists permanently on the NewChurchHistory.org website, where the material can be continuously updated. We are pleased to provide links to three previous Fun Facts that have recently had striking new photographs added. 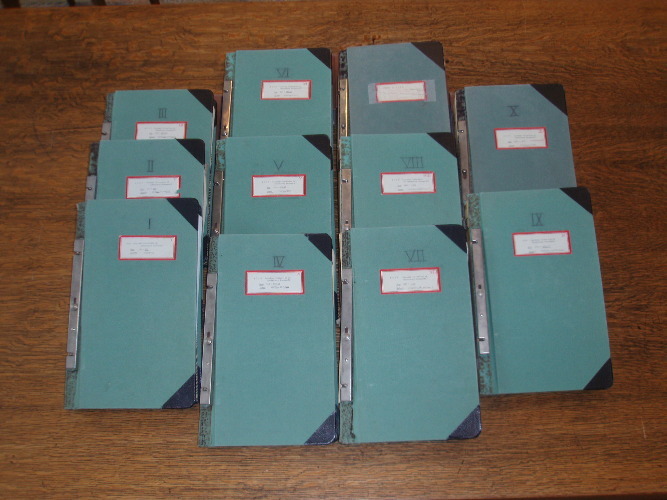 The editors of NewChurchHistory.org would like to thank Marvin B. Clymer, Academy of the New Church Archives, Bryn Athyn, PA, for locating and scanning the new material. Photo credits for the photographs in this New Church History Fun Fact can be found at the end of each of the three Fun Facts listed. Questions and comments may be addressed to the editors at [email protected]. Isaac Pitman (1813-1897), knighted by Queen Victoria in 1894, is famous for having developed a widely used form of shorthand, now referred to as Pitman shorthand. In 1837 he published a small pamphlet on the subject titled Stenographic Sound-hand. 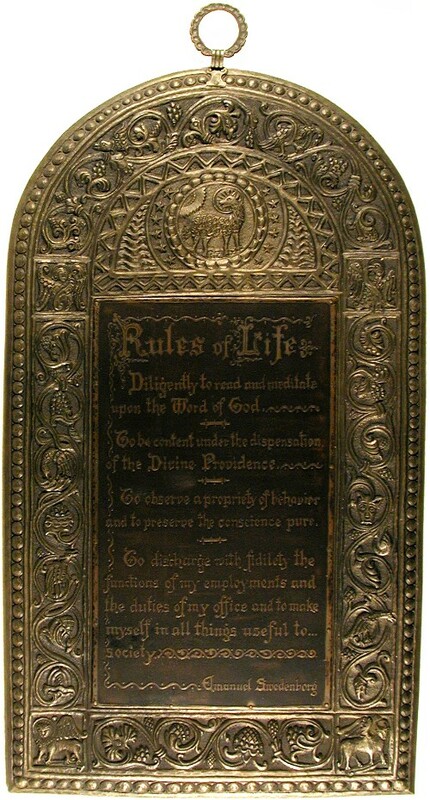 Of interest to our readers is the fact that one of the texts he chose to use as an illustration of his shorthand method was Emanuel Swedenborg’s “Rules of Life.” Pitman, a member of the New Church in England, was very active in the dissemination of Swedenborg’s theological works. 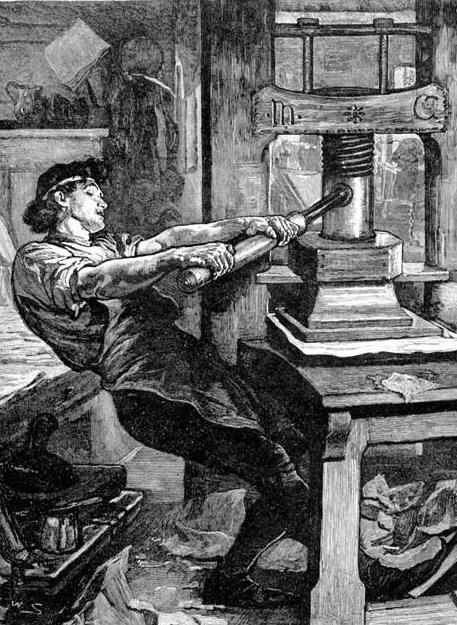 According to Jonathan Bayley, Hiram Powers (1805-1873), the most famous American sculptor of the nineteenth century, “spoke of his great wish to do a statue of Swedenborg, which he wanted to make somewhat worthy of its subject. At different times of his life he returned to this idea, but something occurred again and again causing it to be deferred. 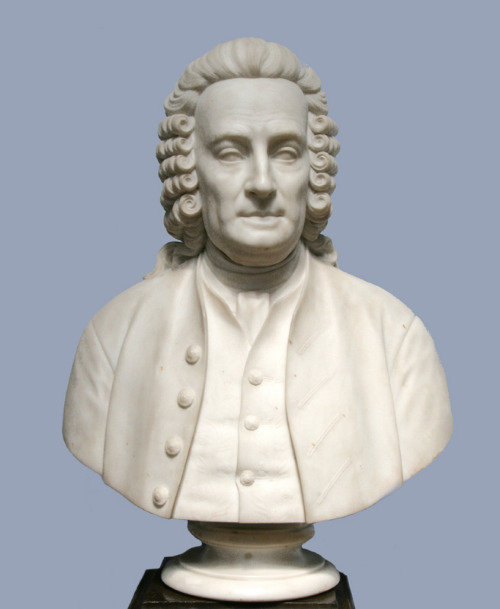 “Fully aware of his father’s wishes and ideas, at last this wish was carried out by Mr. Preston Powers, so far as the beautiful and noble bust is concerned, which now stands in the Swedenborg Society’s large room” (Jonathan Bayley, New Church Worthies or Early but Little-known Disciples of the Lord in Diffusing the Truths of the New Church, 1884). In the winter of 1878, the Rev. William H. Benade (1816-1905 ) and John Pitcairn (1841-1916) were traveling in Egypt, one stop on an extended tour they had begun the previous June. Their purpose was to visit Europe, Egypt, and the Holy Land, spreading word about the New Church and the newly formed Academy of the New Church in Philadelphia. In Egypt they spent three months on the Nile traveling in a dahabiyah, the traditional Egyptian houseboat (see photo, top). 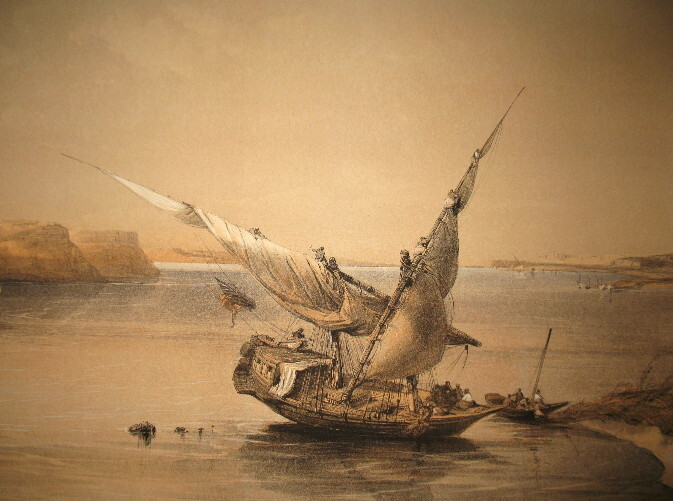 Their boat, the Sylvia, left Cairo on January 10, 1878, traveling as far south as Abu Simbel. The question of what to do with Emanuel Swedenborg’s possessions arose shortly after his death in 1772. 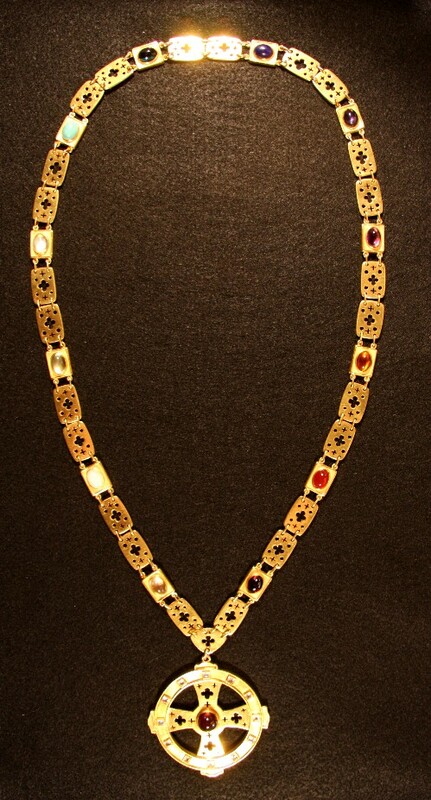 “In London, where he had been living, his signet ring and some other valuables were gathered up and sent along with some papers and clothing back to Sweden in case any of his relatives wanted them. The remaining items were given to various friends. A bundle of letters to Swedenborg from Voltaire, Rousseau and others was not considered worth saving and was tossed into the fire! When the box of Swedenborg’s effects arrived in Stockholm two of his heirs, who were bishops in the Swedish Church, tried to have his papers burned as trash” (Marvin B. Clymer, “Academy Collection of Swedenborg Documents,” New Church Life 2009, 18). 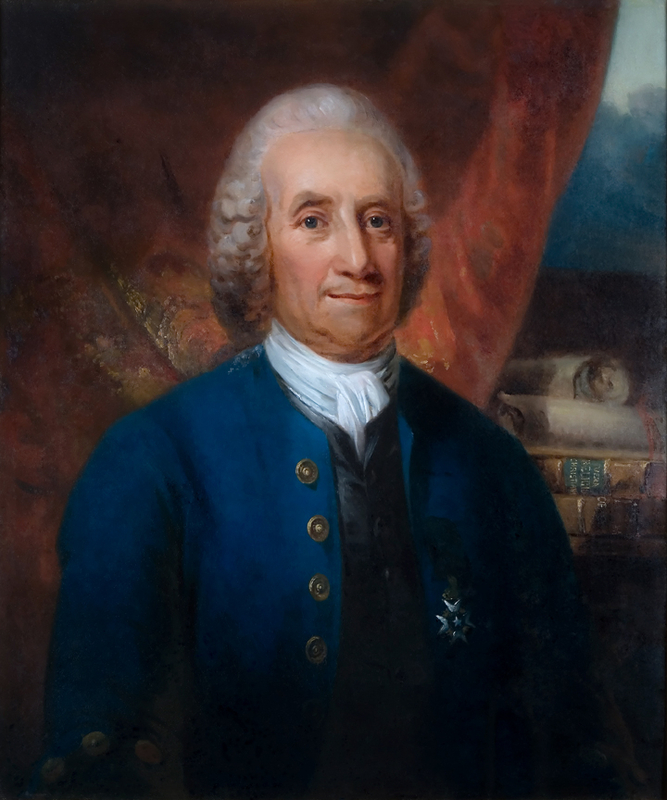 The Swedenborg family subsequently made the decision to donate his manuscripts, diaries, and papers to the Royal Swedish Academy of Sciences. 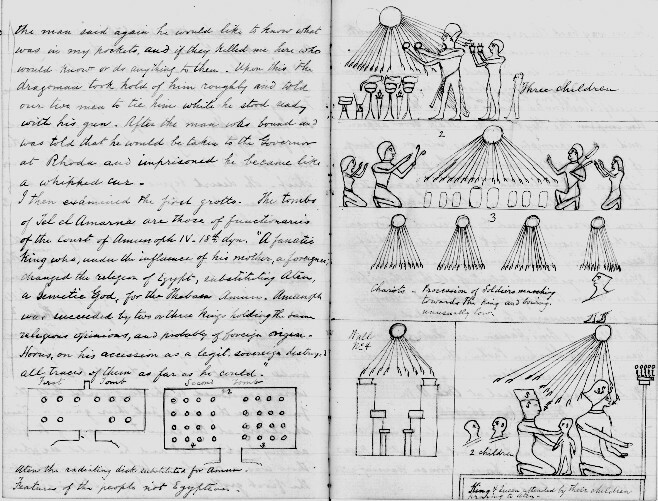 Soon afterwards, members of the New Church began to study and organize the material held by the Academy of Sciences and to seek out additional materials that had not yet been found. 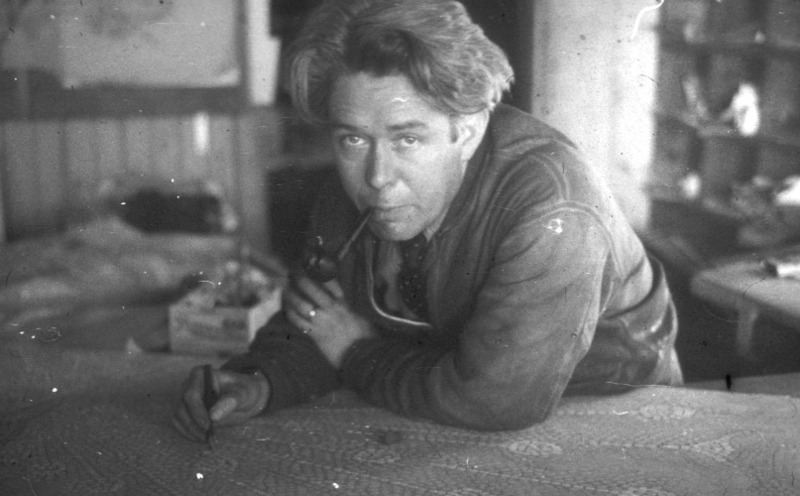 By the beginning of the twentieth century, a great deal of work still remained to be done. Oliver Wendell Holmes wrote that “every library should try to be complete on something, if it were only on the history of pin-heads.” From the beginning, the Academy of the New Church Library (now the Swedenborg Library) has made the effort to be as complete as possible in the area of Swedenborgiana. Rev. 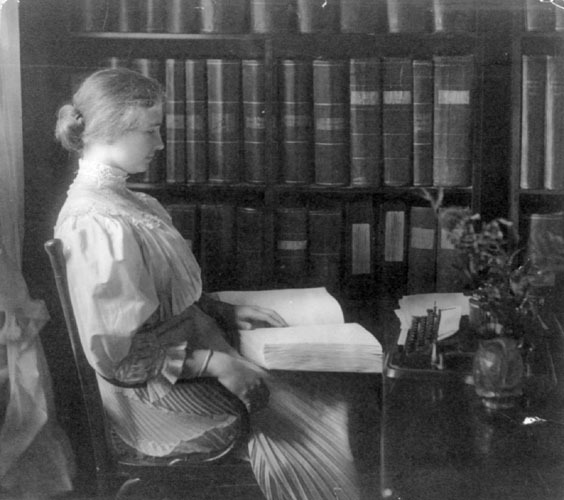 W. Cairns Henderson once defined Swedenborgiana as “the Writings, in print and in reproduction of the mss. ; Swedenborg’s own works in the same two forms; books used by him, documents concerning Swedenborg and literary material relating to him; New Church collateral literature, both books and pamphlets; and New Church periodicals” (New Church Life 1957, 20). Room 17 on the fourth floor of the old library (now the Fine Arts building) housed part of the Swedenborgiana Collection for many years. 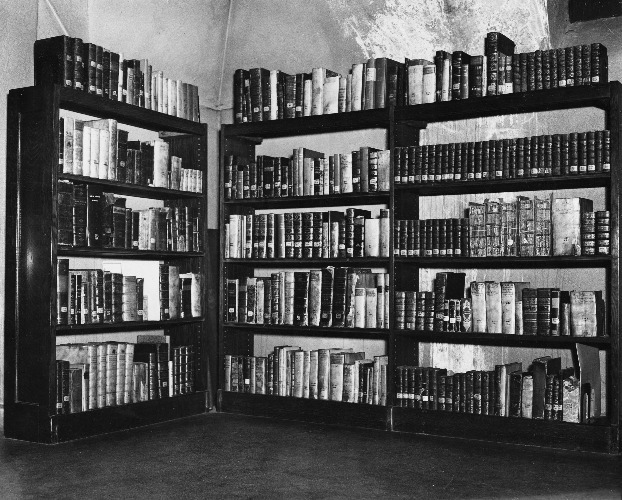 Room 17 (see historic photo, left) contained books known to have been owned by Swedenborg and books quoted from or referred to by Swedenborg, as well as translations of these works. This collection also included contemporary books that mentioned Swedenborg or his work. Glencairn Museum’s new exhibition, “Painting with Light: The Revival of Medieval Glassmaking in Bryn Athyn” (open through July 25th, 2009) is organized into the following sections: “Tracing and Design,” “Finding the Color,” ”Glassblowing,” “Painting and Assembly,” and “The King Window.” The exhibition features a number of original windows, as well as glassmaking tools and equipment, including a glassblowing bench used in the Bryn Athyn glass factory (which closed in 1942 due to World War Two). 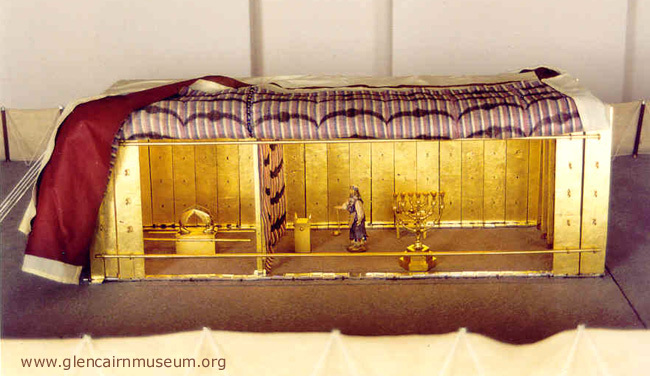 A central feature of Glencairn Museum’s Ancient Near East Gallery is a scale model of the Tabernacle of Israel. 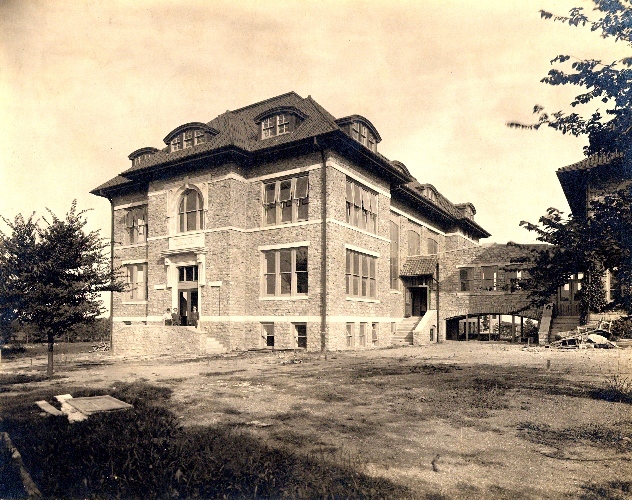 Built over a ten-year period, beginning in 1921, this model was an ambitious educational project designed for the benefit of, and with the help of, the children at Bryn Athyn Church School, in Bryn Athyn, Pennsylvania. 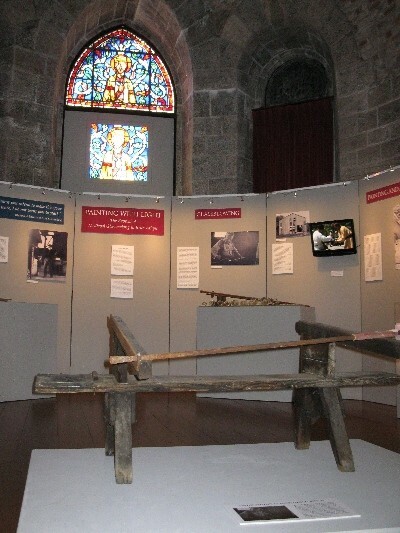 The Tabernacle project was conceived of and directed by the Rev. 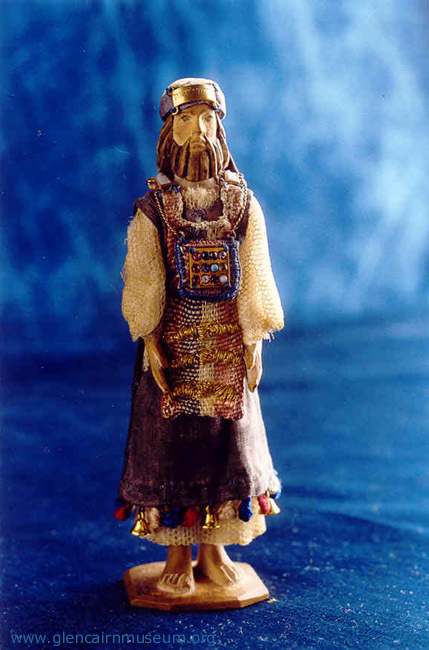 George de Charms, whose book, The Tabernacle of Israel (1969), describes in detail the building of the model and the religious significance of the Tabernacle.